Ideal Upgrade for Align T-Rex 500 and other 500-class EP helis! Higher Efficiency, Less Heat, More Power! Now come with Aluminum Case!! Scorpion Model Products is pleased to announce the release of our new series of Brushless Outrunner Motors. These motors raise the bar in both quality and performance, and are establishing themselves as the new Gold Standard for model aircraft power! All of the Scorpion Brushless Motors are manufactured from the finest quality components using state of the art CNC machine tools. 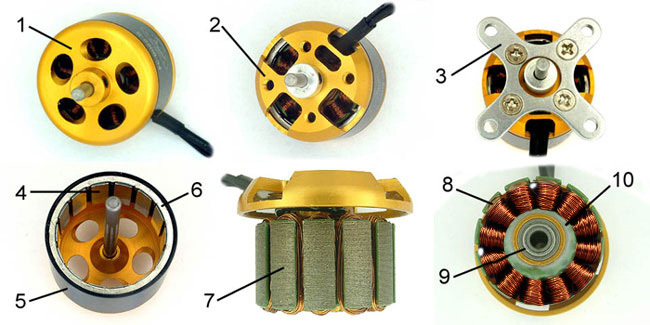 Every component of the motors are of the highest quality, from the materials used, to the box they ship in. They are designed to provide reliable power for your model aircraft at affordable prices, offering a total performance solution. Scorpion Motors are designed from the ground up with the best quality components available to provide an excellent value for you, the R/C modeler. We utilize high quality aluminum alloys that are CNC machined and anodized for a fit and finish that is second to none. Unlike other motor manufactures that use off-the-shelf N50 NdFeB magnets with a maximum Curie temperature of 80 to 100 degrees C, our motor magnets are custom manufactured to be able to withstand temperatures of up to 200 degrees C (392 F) while still providing N50 magnet strength. The wire we use to wind the stators is rated to 180 degrees C (356 F), so it can take the heat and keep on performing. This all adds up to a motor that can provide you the power you need, without going up in a cloud of smoke if you push it a little too hard. With all these features, you would expect to pay top dollar for a motor of this caliber, but with our efficient manufacturing procedures and streamlined distribution chain, Scorpion motors retail for about 1/2 the price of other "Name Brand" Brushless Motors, making them one of the best overall values on the market today. We are so confident in the quality of our motors that we back them with a 2-Year Warranty against defects in materials and workmanship (covered by the Scorpion Repair Facility). You deserve the the best quality motor available at an affordable price, so the next time you need a brushless motor, do yourself a favor and give Scorpion Brushless motors a try, you will be glad you did! Machined aluminum front housing with 5 angled cooling holes that pump air through the motor while it runs. Rear threaded mounting holes with both 16 mm and 19mm hole spacings fit a variety of applications. A machined aluminum cross style mount with hardware and a threaded prop mount is included with every motor, along with a wobbly adapter on select models. Specially designed N50 NdFeB magnets with a 200 C (392 F) temperature rating for trouble-free operation. Durable black Electro-Coat finish on the flux ring to look good for years to come. We also laser engrave our logo and model number on each motor instead of using a sticker to help maintain the balance of the motor. Rear locking ring maintains magnet spacing and also helps to strengthen the rear end of the flux ring assembly. High Temperature 180 C (356 F) rated wire is used for winding the motors to minimize the risk of burning up the motor. The motors are also machine wound to ensure consistant winds. High quality shielded and permanently lubricated ball bearings are used to support the motor shaft in all our motors.